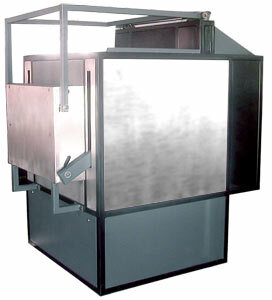 MHI is able to offer large roof-span furnaces with Nanofractal high toughness, low distortion roof hangers. MHI's extensive line of front loading furnaces have the highest uniformity and energy efficiency ratings in their class. MHI's industry proven MoSi2 or GAXP® heating elements for faster heating and greater energy savings. Top opening, counter balanced door. Pneumatic door activated by foot pedal. Double walled, heavy gauge stainless steel construction; the thickest in the industry. Sleek design minimizes furnace footprint. 3 layers of vacuum formed alumina/Fiberfree(TM) refractory. Forced air cooling for minimum exterior temperature. 3 phase control with MHI's TRIPAN control system featuring: starte of the art Eurotherm or Honeywell controllers. Controls are remotely locatable, allowing for centralized control of multiple furnaces. User determined hearth height for convenient loading. Optional stand available. Our front loading furnaces are designed for maximum productivity. Compatible with our low-cost Data Acquisition and Control Software. Contact Us for information on customizing production furnaces for process manufacturing and glass melting. 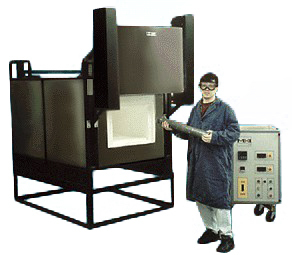 What kind of uniformity do MHI furnaces offer? What kind of energy efficiency do MHI furnaces offer? MHI front loading furnaces feature rugged stainless steel construction, electronic controls capabilities and MHI's highly acclaimed heating elements. 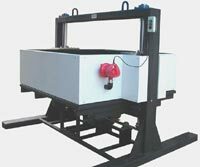 Standard features also include a top opening, counter balanced pedal activated door, 3 layers of refractory and a number or ergonomic features to improve productivity. Front loading furnaces feature maximum operating temperatures of 1800°C and continuous operating temperatures of up to 1760°C. See the tables below to determine which model is best suited for your application. All MHI box and muffle furnaces feature rugged stainless steel construction, electronic controls capabilities and MHI's highly acclaimed heating elements. Our furnaces feature maximum operating temperatures of 1800°C and continuous operating temperatures of up to 1760°C. See the tables below to determine which model is best suited for your application. 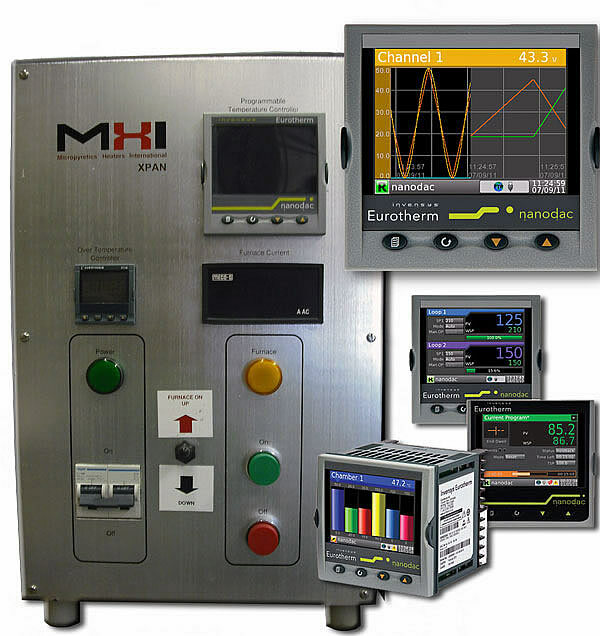 MHI offers remotely locatable electronic controllers with features such as overtemperature controls and programmable steps. In addition to standard electronic controls, MHI DACS allows for data logging and intricate step programming. MHI Tube Furnaces are compatible with MHI DACS and Dacs 2 for furnace controls, 100 step programming, data logging and more. DACS also allows for remote furnace control, allowing one central location to control multiple devices. 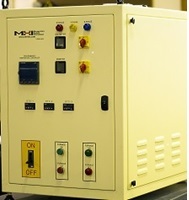 MHI now offers a variety of accessories to be used with our furnaces. Common accessories are clips, braided wire, hangers and other useful tools. To view these accessories, visit MHI Element Accessories or BuyMHI.